Mr. Ronald M. Green, leader of the UWP lead opposition party represents the south eastern rural agricultural constituency of La Plaine, Boetica, and Delices in the ‘Au Vent’ region. He brings with him a long record of activism, community involvement, commitment, hard work and experience of four and a half years as Minister of Education, Sports and Youth Affairs. Opposition Leader Ron Green has faithfully served his community for more than three decades. Hon. Green resides at the edge of the old family estate at Felicité in La Plaine along the banks of the Sari-Sari river with his wife, District Nurse Jocelyn Austrie Green. The Green’s have two daughters named Malaika (angel in Swahili) and Josina. Malaika just completed a Masters degree in Environmental Sciences at the University of Syracuse. The younger daughter, Josina graduated last year with a bachelor’s degree in Computer Science from the University of the Virgin Islands on St. Thomas. Hon. Green was born in Roseau to a prominent Dominican family. He left the island at the age of 11 years to join his parents in New York City. After high school he received a bachelor’s degree from New York College City College in health and physical education then on to Manhattan College where he received a Master of Arts degree in education. In between those two degrees, and just after, he spent six years in Africa teaching. First as a U.S Peace Corps Volunteer at a Teachers College in Nigeria for three years. Then at Makerere University at the National Teachers College in Kampala, Uganda. Six important years understanding Africa- East and West. He then delved into Pre-doctoral studies in Educational Leadership at Columbia university. After twenty years away, Ron returned to Roseau in 1974 and relocated to La Plaine in 1978 and lived in the old estate house where his grandfather spent the winter of his life. 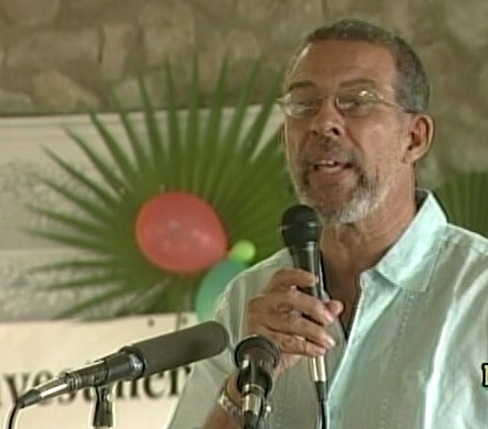 His main reasons for relocating to Felcite was to make a contribution to the struggles of the times and issues of the day and work towards a meaningful contribution and participation in Dominica’s development. In La Plaine, Ron started a youth group which was called ‘Wassen’,-the patois word for roots. Wassen’s mission was to empower the young rural men to focus on positive things in their community for themselves and their families. The old family estate at Felcite at the edge of La Plaine was purchased in the 1920s by Ron’s great grand father Edward Richard Green who was a district magistrate. The estate was inherited by his grand father Rupert who was a town clerk. His great grand father, grand father and father, Vivian, are all buried side by side on the estate overlooking the Atlantic ocean next to Ron’s house which he built in 1981 from the one acre of land which was left for him before the estate was sold. Way back in 1978, this writer’s faith and belief in Ron Green as a true leader of our people were crystallized. Mr. Green’s critics and detractors are quick to label him as a softie and one who cannot be decisive. This could not be further from the truth. Ron prefers to deal with issues in dignified ways and is not a ‘in your face’ type of politician. Given the macho overflow of male testerone in our political culture , shouting the loudest from the roof top means that you are the best, brightest, meanness and toughest. It is easy to understand why Ron is sometimes seen as a ‘light weight’. Mr. Green prefers the cerebral, calm, respective and deliberative way of communicating. Unfortunately, Dominican society does not and for some reason cannot appreciate that professional and respectful demeanor and disposition. Ron brings a new and refreshed sense of order and huge paradigm shift in the antiquated style of platform politics in Dominica. Hon Green stands tall like Gulliver among a sea of political Lilliputians claiming to be progressive. Mr. Green was a member of the left leaning Movement for a New Dominica (MND) party which was comprised of young, patriotic and highly educated intellectuals. In 1980 he was elected to the La Plaine Village Council and served (16 years), five terms with the last term as chairman. In the 1980 general elections, he contested the constituency for the Dominica Liberation Movement (Alliance) under the leadership of Athie Martin. This party was an amalgamation of different groups such as the late Prime Minister Rosie Douglas’ Popular Independence Committee (PIC) and Pierre Charles’ Worker Peoples Vanguard (PWV) and attorney at Law, Dr. Para Riviere Peoples Progressive Party (PPP). Ron has been involved with NANGO (National Association of NGOs) community and project development work with the Dominican Christian Council for more than two decades. In 1981 he co-founded the Small Projects Assistance Team (SPAT). Some of his national accomplishments and contributions (which are too numerous to mention) are: implementation of basic education reforms, universal secondary education drive, resuscitation of National Youth Council, enhancement of youth skills training and encouragement of youth policy development process. A few note worthy constituency contributions that the parliamentarian has accomplished are; the development of the La Plaine Sports complex, La Plaine School Enhancement and the Petite Savanne, Morne Paix Bouche-Delices Road. He was very instrumental in bringing pipe water supply to the hamlet of Boetica. He cofounded and managed one of Dominica’s leading Football clubs (Sagicor South East United Football club) which emerged as the 2007 Cable and Wireless B-Mobile Premiere Football Division champions. For more than two decades, Ron has been a teacher, lecturer, community organizer and coach. These real life experiences have provided him with the foundation to view and treat all Dominicans with compassion, respect and as brothers and sisters. Ron is an honest person with a high degree of integrity and sincere core political and personal values. He is an excellent listener and relates well with young and old, personal fan and foe, political supporters and detractors, visitor and ‘homeboy’ alike. Ron has always put Dominica, its welfare and interests before his own and his political party and friends. He has been the ultimate family man and ambassador of Dominica outside of the island. The well travelled and read statesman is very comfortable in the midst of generals and journalists, colonels and columnists, rulers and writers, scientists, saints and sociologists, investigators and investors, poets, pastors, presidents and politicians, artists and athletes and others from all walks of life. The Leader of the Opposition has earned a deep sense of respect, admiration and credibility among his countryman and compatriots at home and abroad. He holds true to the belief that regardless of colorful and powerful personalities and party affiliations, Dominica and its collective agenda must be first and foremost. These self evident beliefs, attitudes and practices of the honorable gentleman from La Plaine have lead him to conclude that parliament and government are necessary and central to ensure achievement of our island’s treasured developmental goals and objectives. Dominicans all over should wish Hon. Green well and God‘s speed as he takes on the huge burden and mantle of chief custodian and guardian of Dominica’s democracy and its systems in these challenging times. Fortyfive years ago La Plaine folks danced to the popular folk song ‘Cheme wevey Au Vent’ as they celebrated mortorable roads finally reaching this provincial capital of the Au Vent region. Today ‘Jean La Pline’ and the rest of Au Vent’ have another important reason to be jubilant. For the first time in Dominica’s history, one of Au Vent’s outstanding and most deserving citizens has been chosen as the opposition leader, and could very well be the next Prime Minister of Dominica. I pray God that he becomes our next PM. A decent, honest and hardworking man; more than I can say about the incumbent. Hon Ron Green is the most LAZY politician in Dominica. What has Ron done for his Constituency. Ron is undoubtedly the premiere project writer in Dominica today. He is yet to write and obtain funding for one single project to assist his constituents. Ron in over 70 years old the people of the South East have decided to go with Peter St. Jean this time. They are seeing the work of Peter. Nothing you can write can change that. The writing is on the wall for Ron. I understand Ron is planning a major rally in Laplaine. That is sufficient to indicate that Ron is on the Run. No political leader of a party should hold such major rallies in his/her constituency. I am from Delices I live there and I know that Ron is losing big time this time around. Take this to the bank!! Since Dr. Emmanuel Finn knows so much about Hon Green can he confirm or deny the following? 1. That Ron Green was married to an African Woman. What does that have to do with what Dr. Finn wrote? Elevate the discussion. Stop doing like a typical labourite and go into people's personal life. Are you suggesting that the political leaders that you support have a perfect family life history? Grow up and lift the conversation to a level we can appreciate. ===============================================================================So what does that have to do with anything? So you claim you know Skeritt.. Can you confirm or deny that he has a child in Laplaine- by somebody her name begins with M*Y* that he has not cliamned? Can you also deny or confirm that he has other women in laplaine one of who is a dreadlocks teacher.. IF anybody wants Skeriit's cell phone number call her mother.. At least Ron Green was married. To the writer I have an idea who you are.. Those who live in glass houses should not throw stones. Think of your own situtation which you know better than any one esle before you throw stones at anyone.... If I haer from you again I will give more details.. ENOUGH IS ENOUGH! STOP GETTING PERSONAL WITH PEOPLE> If you think signing anonmynous will hide your identity think again.. Too many of us your very filthy mouth. This is sickening! Disgusting is the right word to describe the low down dirty tactics of Skeritt goons.. Their ignorance and lack of class is demonstrated in every word they utter.. Now tell me what does Mr. Green's personal marital status have to be with his ability to run a country? Is the person who stooped to swiming in the Labow a patron of virture? I guess not. I would suggest that who ever it go go and remove the thousands of skeletions that are in his/her closet. Mr. Green is an honorable man of class, and integrity. I have had my disgreements with Mr. Green in the past, but I cannot say anything besides that he is a decent, honorable hard working man, who has given 31 years of service to Laplaine. I vehemently condem the personal assult on Mr. Green. All of you that want to talk about Ron Green will see him win. Tell Peter that I am from Delices we will take his galvanize and vote for Ron. The last time I checked BYGAMY was a criminal Offence..==============================================Now tell me thinking man, why would any body "REMAIN MARRIED" with something that he abandoned or over 30 years? and why would a WOMAN "REMAIN MARRIED" to a man who had abandoned her for over 30 Years.. Bear in mind Enstien that women can also file for and divorce a man..
“ Whosoever, being married, shall marry any other person during the life of the former husband or wife, whether the second marriage shall have taken place in England or Ireland or elsewhere, shall be guilty of felony, and being convicted thereof shall be liable to be kept in penal servitude for any term not exceeding seven years ... : Provided, that nothing in this section contained shall extend to any second marriage contracted elsewhere than in England and Ireland by any other than a subject of Her Majesty, or to any person marrying a second time WHOSE HUSBAND OR WIFE SHALL BEEN CONTINUALLY ABSENT FROM SUCH PERSON FOR THE SPACE OF SEVEN YEARS THEN LAST PAST, and shall not have been known by such person to be living within that time, or shall extend to any person who, at the time of such second marriage, shall have been divorced from the bond of the first marriage, or to any person whose former marriage shall have been declared void by the sentence of any court of competent jurisdiction. There is a similar provision in America the term is even shorter, I think something like three years.. So Enstien do your due deligence before you start yapping or do so at the risk of being Zapped by the Zapper. Ian spoke oepnly of th echaracter of Skerrit, should we then begin to go nto Skerrit`s dirty habits. 3.. should I go on.. why.....why...why.. try to go at Ron,. It is not necessary. Do not throw stones if yo live in glass house. It is of poor taste. If yo wnat to start this character assasniation of persnal life we can go ahead. Ron Greens background was listed, where is Skerrit``s, let us argue on the issue of leadership for our country, where it is at its lowest now. Corruption will be at the head of Skerrits CV, second poor leadership, etc etc. Dominica needs a new focus, direction, decent image and good governance that will unite our people with no distraction. We need honest government to focus on sustainable development, integrity and employment and honestly I see this between Ron Green and Judith Pestaina. The isssue here TRUST, TRUST and TRUST amd knowing where Judith and Ron come from the Country can trust them. For the sake of Dominica please stay focus on development, there are too may distraction and allegations and proof of corruption and bobol. I say to all. Where does integrity begin and end? Opps .... sorry, i guess it is applicable only to political issues. Please give me a break. Integrity begins at home and it is applicable to all leaders, no exception! The way you treat your families is an indication of how your integrity in government. Integrity is Integrity period! With the wealth of knowledge and employment and initiatives and work and success and effort and consistency and in Local government and in village council and in development and in rural development, here goes the competencies for a leader for Dominica, Ron Green. Skerritt: well.......after teaching, min. for Edcuation, Prime minister ( kicked out Pierro) studied and qualified in tax evasion, expert in not paying land transfer to treasury, expert in bobool managemenmt, expert in slamming doors, excpert in running away his ministers, rebel as honurable, the list goes on....we now have to decide. I will certainly make my choice between Ron and Judith....it is a vote for Dominica....stability and development. In an interview there are competemcies an d your compare. when yo look at Ron and Judith and Skerrit,. it is clear Skerrit has failed n huis job after almost nine years. It acannot work. Skerrit has failed, his house is dirty and even more dirty and corrupt. Come on Zapper, don't try this nonsense. You are attempting to create stuff that isn't there. My research only point a man married to 2 woman at the same time. That's all i've got for now. I will get back to you on the rest. Oh by the way, there is a certain individual from St.Jo who calls radio stations daily complaining about the government and integrity but he is a wife beater. Be careful Zapper, every time you point one finger you have four pointing back at you. ===================================================================LOLZapper is trying to be descret here, don't try to bend Zapper's arms or you will be faced with you don't want hear. Zapper has proof. Do you? Do like Zapper get your proof before, that way you can say what you say with authority like Zapper. Be carefull now, or you will get seriously zapped. Very funny Zapper. I dare you. You have nothing. You are all about propaganda. Stop the fear mongering and mind you zap yourself in the process. You are all talk, a pencil without lead, a chicken. Show me the money! Show me the hard evidence. HA HA HA be carful what you ask for! Now don't push it.. Zapper is informed.. Zapper is not about propaganda, Zapper deals with confirmed facts. The people who obviously don't know about and worship that Zapper knows about will not be happy if you push Zapper. Zapper doesn't like to get personal because it is not right. Zapper only throws a few things out to make a point. Don't push Zapper. Now tell me Enstien what has Zapper said here that is fearfull to you? See Zapper picks up stuff. Don't mess with zapper. Point of clarification again--I did not contest Castle Bruce in 1995 for DFP-My cousin did. I have absolutely no intentions or desires of getting into the political fray in Dominica. I know Ron Green very well and I am from La Plaine. To the person who outlined Mr. Green's life in Africa. Does that information has anything to do with development of Dominica? I repeat, Ron is a decent family man and at this time in Dominica we need family men and women to lead us because the moral fabric of our society is going down the tubes. Do you need me to elaborate? I hope you are doing just fine and the folks you support are all ethical and morally sound. Well I am not sure I have more of a response for you. I don't think you deserve a response in the first place. Let's stay away from people's personal life and talk about the future of our country. That is really the central issue I would like to engage you in if you can or able to have that discussion. Obviously you have a very hard time with the positive facts about Mr. Green in my article. I suppose the truth hurts. Oh Oh where is the person who was going to get back to me? Zapper is still waiting patiently. Now Listen up the mud slingers here, and listen good. I am the equivalent of Larry Flint here, just that I don't have the money that he has and I am not into his kind of business. Remember Larry Flint the man who brought down all the hypocritical, right wing nuts who were criticizing Clinton, some who brought the case of impeachment againist him when they were doing worse that what Clinton was doing? Remember well. I hate hypocrites who come out to cruicify others, for no other reason than they do not support them politically, or they disagree with them on issues while the same people who want to destroy others with dirty rumors have all kinds of nasty dirty skeletons in their closet. Zapper will do a Larry Flint on all you. De warned!! Leave people's personal life out of the politics or do so at the risk of having you own closet of skeletons opened by the Zapper for the world see how hypocrite you guys are. Dr Finn and Zapper and the few internet uwp users are not stupid , they just have not admit that the uwp will not form a government in Dominica as long as Rooosevelt Skerrit is there. So Dr Finn, you will have a few more years to enjoy the cold winters and short hot, humid and hazy summers in DC. Will tell you when to come down, but it will not be ron lazy green. The mafiasos can start gathering their base ball bats, because this time around you guys are going down big time!!!! Zapp, Zapper,Zipp,Zipper...you really think that Dominicans are going to pick ron lazy green instead of Roosevelt Skerrit. You "doh" see how Dominicans (the votes that count) are not studying you fools. Keep making noise. Get your drums and your horns and run around ministry 7 times and have ron lazy greendo the moon dance. Zapper, just imagine this scenario, UWP wins the election. All UWPites celebrate for a few days. When things have settled and time to form the government guess who shows up? Lennex Linton, Groovy Bat, and the Christian brothers just to name a few. They go to Ron Green all demanding high paying jobs which the country cannot afford. Now Mr. Green who owes the victory to these guys because of his laziness and lack of vision for the country would be required to put integrity before Loyalty. How do you think Mr. Green would react? I know how Mr. Skeritt would react. Just look at the Christian brothers... Do you think that Mr. Green would have guts to set these guys straight? I didn't think so. So Zapper, think about the true corruption and confusion waiting to happen if your people get into power. I know this is hypothetical but it is highly likely. So Zapper I say to you it's time for you to cross the floor. The UWP is regressive. Just look how hard the DLP is working to move DA forward while the UWP is just focus on alleged corruption. Other than the corruption talk, please give me a list of Mr. Green's plans for the country. What is his position on ALBA, China and Taiwan. Are you aware that Mr. Green is just echoing everything that Lennox and others say? Please address each one of my concerns. For your information whowever you are, the Skerrit led government is corrupt and devisive no wonder Ian cried out for help and others in there kept silent. The Labour pary is disintegrating from within and is a liability to Dominicas development. You better open up your eyes to what is happpening if o say your love Dominica. YOu just cannot accept th fact that the Labour are gong to be out of goerment as they have performed bad and they have systematicaly stole the peoples money. You really live in fear and are presumtious to think that the UWP are gong to be corrupt when they get into government. The only party with a history of being kicked out of government is the Labour party, it happened in 1979 and look where they are again. They just do not learn and agin they have set Dominica 10 years behind. It is a shame, a damn shame. Dominica deserves better and Skerrit is a big diasappointment. If you put Dominica first on principle andlove for country you will vote for Dominica and kick Skerrit out of governemnt. Your talk therefore is baseless and fearful. My friend have no fear, you are the one to open up your eyes and vote for Dominica, she deserves another chance of develoment. Corruption is looking at you in the eyes and yet you still sing the song of blind loyalty. Were it not fo the Christian brothers, Lennox Linton and the opposition parties, Freedom and UWP, we would b blind to see the Thieves in goverment led by Skerrit. He i corrupt to the bone with deliberate habitual intentions to steal the country`s money, that for me in big time coruption and that would be his legacy when he is kicked out of government. It is a damn shame, Skerrit is big time disappointment and he will NOT get my vote,Dominica will. So Good luck to Freedom and good luck to UWP. We tried labour they have failed. Dominincas development should be based on what we as Dominincas first want for our country, ALBA, China and Taiwan are not Dominicans and do not determine the path of Dominicas development, we as a people who do. First we have to commit ourselves to development and we have to determine our path for development, where we want to go. Therefore ALBA, like every other resource will assist us and dictate to us, that is called foreign relations aid that supports Dominincas development plan. I am sorry that you are unable to see that bigger picture and vision. I can see your limitation and that Skerrit has reduced some Dominincas to think and view development as the RED CLINIC, Chavez, and CHINA. There is nothing wrong with China, Taiwan, ALBA etc, the isue is Skerrit and his government who are corut and visioneless and we are the ones to determine our destiny, not them, so they are irrelvant to the bigger issue and concern. The only obstacle we have now to our develoment is Skerrit and those who are detrmine to support and condone his corruption. Domininca is NOT making money, I know so because I am in there in Government. Like Ian says and sees we only involved in mediocre development and distractions. So please come better than and hand outs and begginig attitude will not devlopment Dominica. Raise the bar in your thinking, open you eyes and come forward and join the rest of us civil servants and Domininca in general to develop our beloved country before it gets too late. The Christian brothers, Lenox etc are not the issue, yo must admit they brought us issues to think about. To: Anonymous : June 26, 2009 11:15 PM and those that have commented thereafter. I take it that the Anonymous of June 26, 2009 is genuine in his request for information and it would be nice if his request can be addressed. Although judging from his tone he may not be honest in his request. Zapper, who seems to be a UWP insider, may wish to address these issues honestly. I am not an insider of any party, I am just an ordinary Dominican following the events in my beloved country and must state that I am extremely disappointed with PM Skerrit and others in his cabinet. I am searching my mind to find a minister that I have respect for but unfortunately none come to mind. Dr. Mc. Intyre for whom I had some has lost it even before the Dopwell issue. We have heard and seen the unexplained increase in wealth by some ministers and their close relatives and friends and that bothers me tremendously. We have seen the inclusion of Julius Timothy into the Cabinet and yet the corruptions allegations that were made against UWP in 2000 continue to be brought up by Labor. Ironically most, if not all the incidence being mentioned were, according to Labor then, orchestrated by Julie. What this says to me is that this government is disrespectful of the people and boldface in their corruption activities. What we need in Dominica now is a group of honest politicians to lead us. We do not see that in Skerrit and his crew so we need to get them out. We have known the honesty and integrity of both Ron and Judith and Dominicans should seriously be thinking of having one of these two leaders to run the country in the immediate future. My plea therefore is for Dominicans to examine the situation in Dominica and when making their decisions, put Dominica first. If that is done I am totally convinced that Skerrit will be out of office and have to account to the people of Dominica for his stewardship over the past five years. It is my understanding that Mr. Charter is already requesting a new place of work. I wonder if he is making plans for what he see coming. All opinions respected here. Let us say for argument sake that all what you say is true. The question still stands, WHAT ARE THE UWP PLANS FOR DOMINICA? I have been asking this questions for many months and no one wants to answer it. All responses are focused on the ALLEGED corruption. Zapper come on...I'm begging you, I'm on my knees. I want to vote UWP but they are bankrupt on idea. This is my last attempt at this because I seem to be wasting my time here. Last chance Zapper and stop dancing around the question. I am sure, and for the sake of Dominica, hope that Zapper or some other UWP insider or a Freedom Party insider will come in here and articulate their respective party's policy. One thing I am very certain of, is that it surely will not have programs that will perpetuate the dependency syndrome that exists now. And I would hope that they have in their respect plans to investigate and prosecute those who have misused Dominica's resources for their personal benefit. And I hope that this investigation goes back from 1995 onwards. Even those who have fell out of grace with PM Skerrit and fall in that category should be investigated. It is high time that examples be made of public officers and officials. (1) for the person who commented that Zapper seem to be UWP insider, let the set the record straight… I was one of the people who the labor party was able to convince that UWP was corrupt, and if I was indeed a strong UWP supporter that has lost me support because I believed the LP. See I have no stomach for corruption, but I have studied the evidence on one side (LP) and the lack thereof on the other side (WUP) and I have concluded the present LP is the most incompetent, arrogant, lawless and corrupt Gov. Dominica has even seen. Thus my total distain for that Gov. I am a supporter of UWP, I am a fierce opponent of LP. Right now anything is better than labor as far as I am concerned. (2) For the person who asked me about UWP’s plan I am not privy to it yet, but I suppose it will come out in their manifesto, however for me I can wait until they put it out. I am confident it will be a better plan that what we now how. Any other plan is better than what we now have. (3) What is so good for Dominica in Skeritt’s so called plan. Do you call begging Venezuela, China, Libya a plan? Do you think the deals that this bankrupt Gov. is making with China a development plan? They are deals that are against the interest of Dominica and the Dominican people. What has Skeritt done besides that and boast about it? Shame on you for even suggesting that these acts of treason against Dominica are a development plan. This is just a ridiculous song sheet that the masters of deception (they call it psychology) the disgraced LP gave their goons to sing from, but it is not working. Zapper and other forward thinking, rational, sensible people will drown that music. (4) For the person who suggested that I join the LP, thank you very much, but no thanks, Zapper do not want to be in this den of incompetent, arrogant, corrupt, people, not even if they pay me five million dollars. Zapper is principled, I hope the few of you who are out their making the case for Skeritt, and trying to defend in indefensible doing it will tap into your conscience and come to your senses just as I did!! Hope that covers it all. As I stated earlier I am a civil servant and now what is going and in particular arobf agriculture and fnance. I am very disapponted in Colin Mc Intyre and and te qustn of allegaton, here are some questions: 1. Why did Skerrit have to pay the treasurer for land transfer. If it were not for Matt it wuld have gone through. That is blatant and deliberate corruption. A Pm to decide and collude with lawyers to do and call it a "mistake" and backed up by Tony Astaphan and the other lawyer...My God, what ohter evidence do yo need? What abpt the other deals that are yet to be confirmed. 2. Why is the Dopwel and his co conspirators, PM Skerrit, Colin McIntre, Cecil Joseph etc are asked to pay back over $500,000.00 dollars after over charging poor Dominica for bis. What is this, it is caled BIN BOBOL. I is riht inyour face, do yo agree of this deal. Get into your big head zapper, zeegee, zipper, zeebra...you and the uw will never win an election in D/Ca again. uwp will be ZAPPER with ZEEGEE at the polls,one plus one is two..Right now you paid goons of skeritt are so confused. You don't know what is what and who is who, one doesn't even trust the other anymore and they have a right to becaue there are so many just waiting for the right time to jump that sinking ship, and so many who allaready have. It is only those clutching at the last straw that are still there making fools of themselves for Seritt, there are also those who know what they will lose if Skeritt loses, some even thier freedom, so they will fight to the last man. I suppose those judging from what you come up with, you are in the former category and not the latter. FYI Zapper is not Zeegee. All rationale people who can analyse things can see clearly that labor party is fenished not ony are they fenished they are also descending into infammy.. The will end up as the most despesed set of people to ever be in Government.. Zapper will be making a dedicated contribution to that demise. all the folks who support the dlp are as corrupt as their leader.they are as currupt as he is are lazy have no morals and are really not christians they all should remember that they have to answer to a Higher authority as to what they contributed to their world. Let me confirm that ZEEGEE is not Zapper. I see that this is what it has come to. When issues are raised the DLP diverts attention and instead resorts to trying to identify persons or they resort to personalities. Anyhow I cannot say that DLP will lost the next elections but I sure do wish and pray for that to happen for the sake of Dominica. Either Judith or Ron will be a welcomed breath of fresh air after the downward slope Dominica went through morally since the death of Pierro. Oh and Mr. Charter sure should be given some extra work after the gross mismanagement of the country's resources that went on in the recent past. By the way, Zapper I apologize for interpreting and insinuating that you are a UWP insider. But I agree with you, all established parties have a better plan than what is being implemented in Dominica now. And you know what is so hurtful (to use Ian's word), there are some that seek to justify and even glorify the unsustainable and maybe illegal policies such as the red clinic. ZEEGEE you and I are in the same arena, it is time these people realize that ALL Dominicans will not be made a mockery of. I am praying to Dominican's need to be set free.. I ask these Frauds who ar in positions of authority to LET MY PEOPLE GO! They are consumed with GREED and LUST FOR POWER! their collective egos is bigger than the land of Dominica itself.. Looking in from my outside vantage point, Dominica is in serious crisis. Dominicans at home to thank those oustside for looking at Dominica objectively and critically with no fear of repersuccions. The politicinas make mockeries of them, their church makes mockeries of them. I anw listening to Pastor Bernard Joseph preaching to his cult followers and addressing the critics who spoke about his $50,000. birthday gift and party at the Crazy Coconuts, and I tell you this is scary.. Is this all we got in Domonica? What has happened to our people? You seem to fail in representing the full story. I Thank the writer for letting us know so much about Ron Green. Can he Ton Green confirm or deny the following? 1. That he Ron Green was married to an African Woman. I look to your response.